Schematic depictions of the auditory stimuli used in experiments 1 and 2. On the left is a depiction of the auditory waveform, in the middle is a depiction in standard musical notation, and on the right are the mean ratings of beat presence given by participants for each condition (mus, musician; non, nonmusicians). Red lines mark the onsets coinciding with the beat (applicable to beat conditions only) and correspond to the first note of each measure in the music. Volume accents are indicated by higher relative height (in left) or accent symbols (< in the right). The depictions represent an excerpt of ∼2.5 s.
Statistical parametric mapping (SPM) analyses. 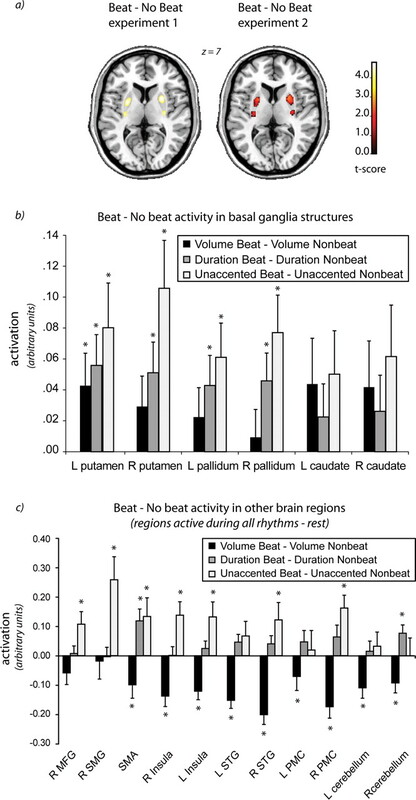 The beat versus nonbeat contrasts overlaid on a template brain (a) and as extractions from regions of interest (b, c). Beat versus nonbeat SPM contrasts for experiment 1 and experiment 2 (for experiment 2, activation is masked by same contrast from experiment 1). 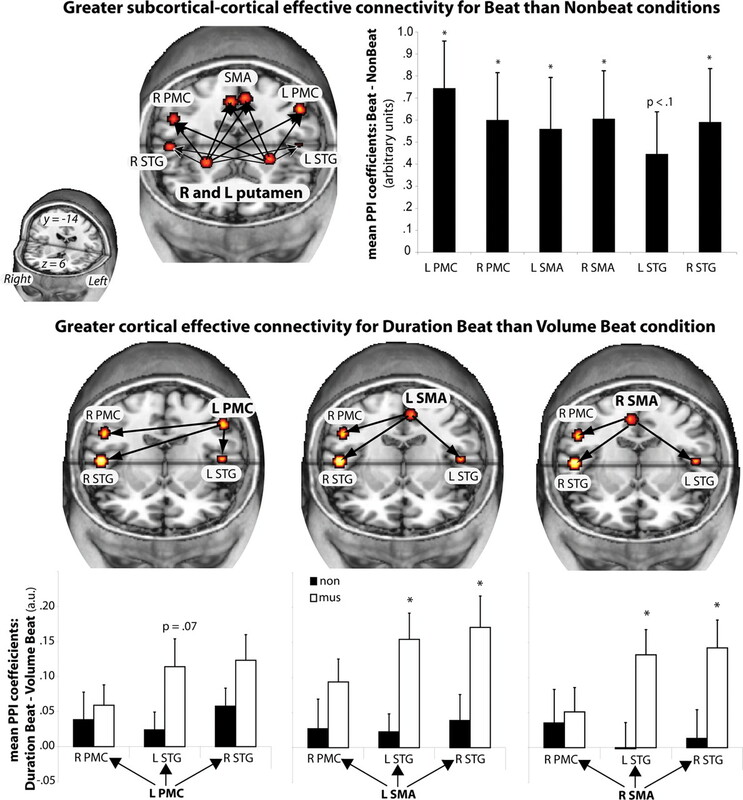 Both experiments show significant bilateral activity in the putamen for this contrast. For experiment 1, peak voxels are p < 0.05 whole-brain FDR corrected. For experiment 2, peak voxels are p < 0.05 small volume corrected. Z refers to the level of the axial slice shown in stereotaxic MNI space. The graphs in b and c show mean activation (in arbitrary units) for the volume beat versus volume nonbeat and duration beat versus duration nonbeat contrasts (from experiment 1), and unaccented beat versus unaccented nonbeat contrast (from experiment 2). b shows extractions from basal ganglia regions (as defined by Tzourio-Mazoyer et al., 2002) that were of a priori interest in this study. c shows extractions from peak voxels in additional regions active in all rhythms versus rest contrast in experiment 1. *p < 0.05 (significant difference between beat and nonbeat for that condition). R, Right; L, left; SMG, supramarginal gyrus; MFG, middle frontal gyrus. Connectivity analyses in experiment 1. Top displays regions showing increased coupling with the anterior putamen in beat compared with nonbeat conditions. Mean PPI coefficients (arbitrary units) for each of the target regions are shown in the graph. *p < 0.05 SVC. Bottom displays regions with increased coupling during the duration beat condition versus the volume beat condition. Mean PPI coefficients (arbitrary units) from the target regions for each of the significant source → target pairs are shown in the graph (p < 0.05 SVC). Coefficients for musicians and nonmusicians are shown: *p < .05, significant difference between groups (independent samples t test). R, Right; L, left; mus, musician; non, nonmusician. This table shows the brain region, t values, and stereotaxic coordinates (in millimeters) of peak voxels for experiment 1 (p < 0.05 whole-brain FDR corrected) and experiment 2 (p < 0.05 SVC using mask generated from experiment 1 beat − no beat contrast, thresholded at p < 0.05 FDR) in MNI space. L, Left; R, right.